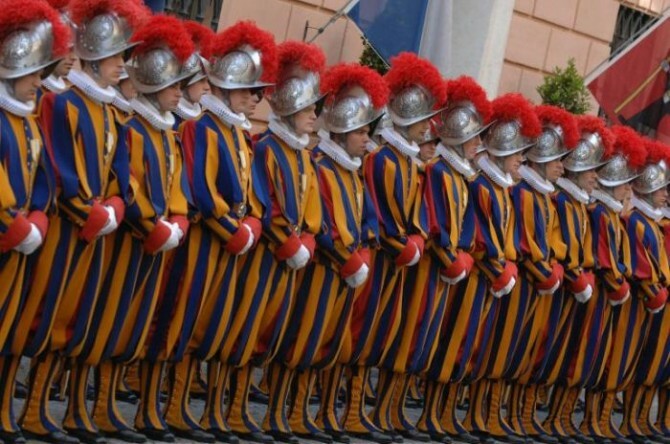 Last week a special event was celebrated in the Vatican: the Swiss Guard’s birthday. This corp is in charge for the Pope’s safety since 1506: given the great political instability the then Pope Julius II decided to recruit soldiers from Switzerland, which at that time was home to the most well trained men at arms, to such an extent that all European kings used to hire them for their own protection. Guided by Captain Kaspar of Silenen, the first Swiss garrison of the Pope officially entered the Vatican on 22 January 1506. They gave proof of their trustworthyness very soon: when Rome was assaulted and ravaged in 1527, the Swiss Guards defended the Pope at the cost of their lives: out of 189 soldiers only 42 survived, basically just those who had taken the Pope to his fortress in Castel Sant’Angelo (a fascinating monument today open to visitors). The Swiss Guard uniform is actually quite recent: its current shape and colors date back just to 1914, when the new design was created following some drawings by Raffaello. 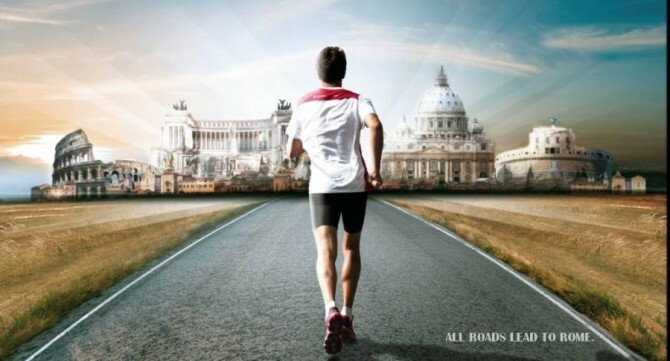 Yes Hotel is well connected to the Vatican City by metro: catch line A (at just 5 minutes walking from us) and get off at Ottaviano! 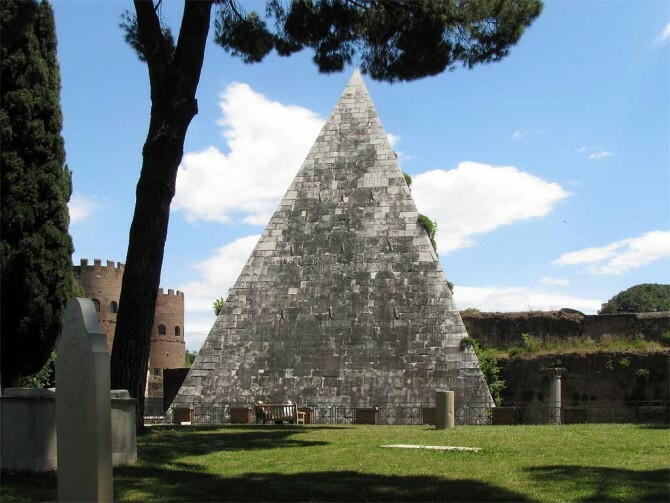 WHY A PYRAMID IN ROME? Rome conquered Egypt by its army, but Egypt conquered Rome by its culture. We owe to this cultural influence the still standing pyramid in Rome located slightly outside the beaten tourist tracks although not far from the core area. A strange story lays behind its construction. Roman dignitary Cestius wanted his heirs to build this unusual funeral monument in a very short time lapse, on pain of excluding them from his testament. Some more pyramids should have been built in the Eternal City around the I Cent BC under Egyptian inspiration, but this is the only one survived, probably due to the fact that since the III Cent AD it was guzzled in the Aurelian Walls as a bastion, which contributed to prevent its ruin and devastation by robbers. Piramide di Cestio is one of the less known ancient monuments in Rome, and it’s certainly worth a visit, being so close to a couple of notable spots: the Protestant Cemetery (where big names such as Shelley and Keats rest) and – on the more mundane side – Eataly: the world renowned market for Made in Italy original food. To commemorate 2000 years after Augustus’ death (the great emperor passed away on 19 August 14 AD) Rome had settled two majestic exhibitions which will still be running for some time even in 2015. The reason behind these long-lasting celebrations has to be found in the deep social and political changes that Augustus’ governance brought to the Roman domain, marking its official shift from the status of republic to empire. The first of the two is mainly a colossal digital expo which, through the most sophisticated interactive technologies, offers a conceptual itineray developing across 4 cities formerly part of the Roman Empire: Amsterdam, Sarajevo, Alexandria of Egypt and Rome of course. Each of them is currently hosting a branch of the joint exhibit project called “Keys to Rome”. It’s not a random choice: visitors will approach Roman Empire history from four different points of view corresponding to the former four different corners of Augustus’ reign. The second exhibit highlights instead the impact of Augustus’ rule on the traditional Roman culture. One of the most meaningful changes he introduced has to do with time calculation: he didn’t hesitate to add new festivities and events to the Roman calendar even for propaganda purposes. Yes Hotel is at walking distance from Palazzo Massimo, and at short bus journey from Trajan’s Market! From January 24 Italian film industry greatest productions and artists will be protagonists of a brand new exhibition at Cinecittà, the cinema studios home to Fellini, Sergio Leone and many more milestone of world cinema. “Shooting in Cinecittà, 1937-1989” leads visitors across three genres of movies in particular: Hollywood on the Tiber, Italian comedy, Neorealism and Spaghetti Western. Historical and propaganda movies on display include The Siege of the Alcazar, 1940; The Iron Crown, 1941, while from the Neorealistic side there will be shown Miracle in Milan, 1951; Bellissima, 1951; Umberto D, 1952. A large section is dedicated to stars such as Audrey Hepburn, Jayne Mansfield, Ava Gardner and Italian Loren, Lollobrigida, Mangano. Attention will be given to customs, such as those worn by Alida Valli and Farley Granger in Senso, 1954, by Luchino Visconti; Elizabeth Taylor and Richard Burton in The Tame of the Shrew, 1967, by Franco Zeffirelli; and Clint Eastwood’s outfit in A Fistful of Dollars, 1964, by Sergio Leone. 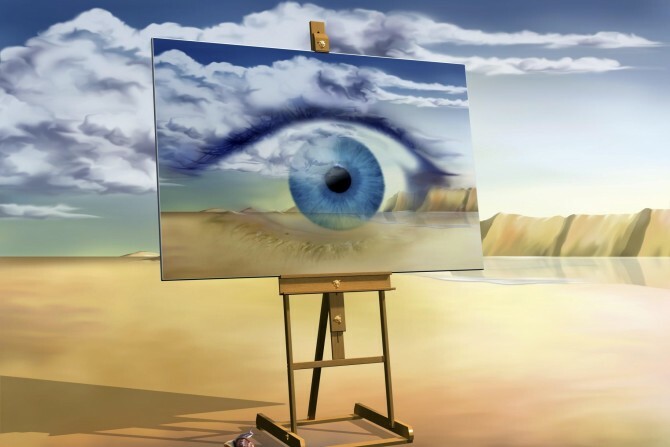 The exhibit is in Cinecittà Studios, Via Tuscolana 1055: just catch metro line A and get off at Cinecittà. Open every day but Tuesdays, from 9.30 am to 7 pm. Don’t hesitate to ask Yes Hotel’s staff for more details! Il piu grande nemico della conoscenza non è l’ignoranza, ma l’illusione di sapere, dice il fisico Stephen Hawking. Intorno a questa considerazione ruota la decima edizione romana del Festival delle Scienze, ospitato dal 22 al 25 gennaio all’Auditorium Parco della Musica di Roma. A prendere parola saranno alcuni tra i più importanti scienziati contemporanei, come il matematico di Oxford Marcus du Sautoy, e il nostro Carlo Rovelli, la cui attività è attualmente rivolta allo studio dei buchi neri. Non perdetevi uno degli eventi filosofici e scientifici più intriganti dell’anno: lo staff di Yes Hotel sarà lieto di darvi ulteriori informazioni sul programma e la sede del festival! 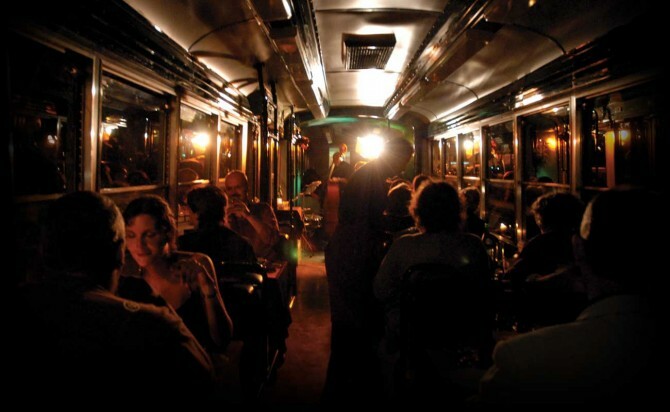 For a good bottle of wine and a gourmet Italian dinner on the sound of live jazz performances, Rome has a cozier alternative to any traditional restaurants or lounge bars: it’s TramJazz, a cable car of 1947 totally restored to be turned into a warm travelling restaurant and evocative concert hall. The cable car itinerary twists and turns around the most enchanting spots of Rome city center, while guests, accompanied in their romantic dinner by live music of high quality, will be tasting the best of Lazio local food. The 3-hour event starts at 9 pm; you can take part to it upon previous booking, that we suggest to make fairly in advance. Yes Hotel is at your disposal for any further information! For both fashion addicted and just “made in Italy” lovers, winter sales time is definitely the best to land nice items at good prices. They begun few days ago, being over on February 15, which provides shoppers with a six-week long chance to make their good deals. Beyond pointing at the big brands’ venues such as all the area from the Spanish Steps down to via del Corso, via Frattina and via dei Condotti, Italian and International more affordable brands will offer up to 50% discounts. Via Cola di Rienzo (next to the Vatican) as well as via Nazionale (between Termini station and Republic Square) are among the best options. But sales are not just about city center: in the outskirts of Rome at least a couple of outlets and shopping malls meet customers’ desires of Italian brands at good prices. We particularlu suggest Castel Romano’s Designer Outlet and the Valmontone Outlet, which are connected to Rome city center by a special shuttle service or regular buses. Our staff at Yes Hotel will be glad to provide you with more information about the most convenient shopping spots in Rome!